A state lawmaker says a new I-70 interchange being built in eastern Missouri’s Warrenton highlights the need for more funding for the Missouri Department of Transportation (MoDOT). Voters in Warrenton have approved two citywide sales tax increases to fund a new interchange there. 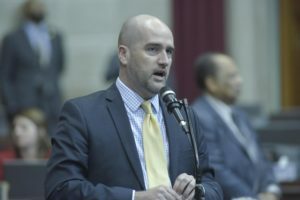 State Rep. Greg Razer, D-Kansas City, addressed the issue on the Missouri House floor on Wednesday, telling colleagues he’s frustrated. “Instead of the people of Missouri saying we’ll pay for something we own, we ask the people of Warrenton to increase their city taxes to pay for something that wasn’t their sole responsibility to pay for in the first place,” Razer says. Razer, a Democrat, supports legislation from House Transportation Committee Chairman Bill Reiboldt, R-Neosho, which would place a ten cent gasoline tax increase on the November ballot. Missouri’s 2018 legislative session ends Friday evening at 6. Razer says Missouri lawmakers haven’t had the political will to increase funding for MoDOT. “This is a failure of those of us that are elected in this building (the Statehouse in Jefferson City) to properly fund MoDOT, so they can take care, these are our roads and bridges,” Razer says on the House floor. Missouri’s fuel tax hasn’t been increased since 1996. The state’s gasoline and diesel tax are both currently at 17 cents a gallon. Razer addressed the issue on the floor Wednesday with State Rep. Bart Korman, R-High Hill. Warrenton is located in Korman’s district. “That took funds away from them (Warrenton) that they could be using for a city purpose, because we (the state) weren’t living up to our responsibilities?” Razer asks Korman. “Right, or even matching it,” Korman responds. Korman says MoDOT has eliminated that matching program, because of funding issues. Korman also says the new interchange is an additional one, which he expects will open in about a month. Razer served on Missouri’s 21st Century Transportation System Task Force, which released its 87-page report to the legislature in January. The task force is recommending a ten cent gasoline tax increase and a 12 cent diesel tax increase. Task force chairman State Rep. Kevin Corlew, R-Kansas City, says ten cent gasoline and 12 cent diesel tax increases would raise about $430 million annually for transportation. “Warrenton is the central stopping point for travelers headed to Mizzou football games, the Lake of the Ozarks or to Missouri Wine Country,” the city website reads.